A comfortable 100 room hotel located on Dublin's Talbot street, just two minutes walk from the International Financial Services Centre and adjacent to O'Connell Street, the Ripley Court combines high quality, competitive prices, and an ideal location, making it one of Dublin's fines three star hotels. Each of the Ripley Courts 100 en suite executive rooms include multi channel remote control televisions, direct dial telephones, ISDN lines, irons and ironing boards, tea and coffee making facilities, personal safes and electronic locks. The hotel offers single, double, twin, triple and family rooms. 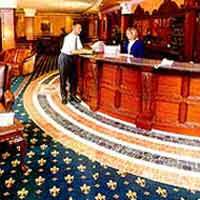 The hotel is home to The Ripley Inn, The Anna Liffey Residents Bar, and The Shamrock Restaurant. The Ripley Inn opens daily from 10:30am to 11:30pm with traditional music sessions on Friday, Saturday and Sunday evenings and bar food served from 4pm to 9pm. The Anna Liffey residents bar, with its mural of Gandon's Custom House, provides an ideal setting in which to relax and unwind after a busy day. The Ripley Court is located on Talbot Street, adjacent to O'Connell Street, Dublin's main thoroughfare, and an excellent shopping street. It is also located within five minutes walking distance of Grafton Street and Temple Bar and just ten minutes from Stephens Green.